Three years after the success of Dawn of the Dead, George Romero stepped out of his defining genre to direct something more unexpected. 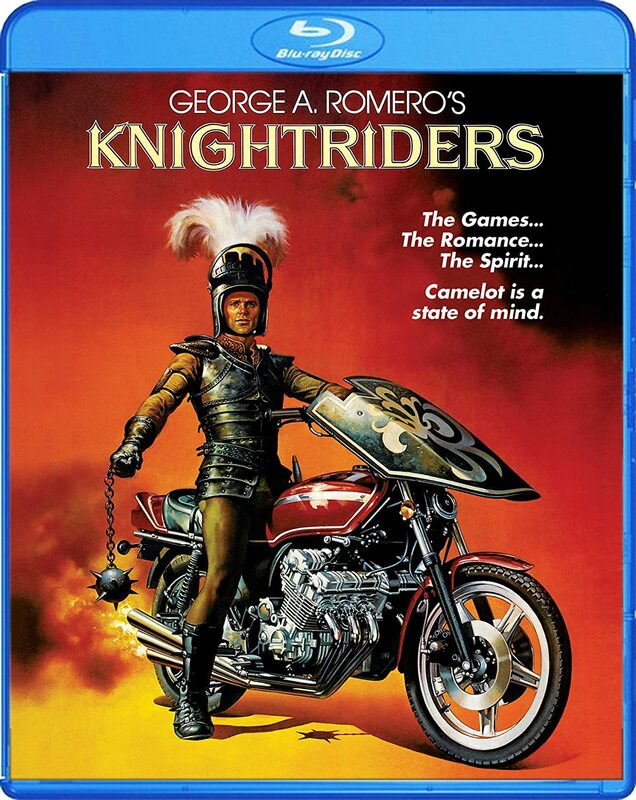 Based solely on the film’s original poster, painted by famed fantasy illustrator Boris Vallejo and featuring Ed Harris striding a motorcycle in medieval armor, handlebars in one hand and a spiked flail in the other, you might expect Knightriders to fall in line with the Roger Corman drive-in genre of futuristic barbarian movies, an upscale Deathsport with a middle-ages theme. Romero’s film couldn’t be farther from it. Knightriders does indeed offer riders in suits of armor over tunics and tights, jousting on motorcycles and battling with swords, maces, ornate axes and other ancient weapons, but it’s part of the spectacle they provide for local audiences with their traveling Renaissance Fair. To the crowds it’s just a show but for this community of cycle-riding gypsies and old-school artisans and craftsmen, it’s a good-natured competition undertaken in the spirit of their Arthurian inspiration. The screenplay echoes the King Arthur legend but stops short of attempting to recreate it in literal form. Ed Harris took his first leading role as Billy, the benevolent king of the troupe and an idealist who aspires to the chivalric code in the modern world. He created this scruffy nomadic community and struggles to hold on to his singular vision as the troupe grows. The supportive Merlin (Brother Blue) is the troupe’s medical doctor, a man who dropped out of the traditional medical culture to be a healer, shaman, storyteller, and Billy’s most trusted advisor. You can pick out a Guinevere in his Queen Linet (Amy Ingersoll) and a Lancelot in the loyal Alan (Gary Lahti), the heroic and handsome right-hand to Billy, but there is no betrayal of vows between them. There’s a Percival in the silent Native American local (Albert Amerson) who challenges Billy during an exhibition and then becomes his devoted shadow and protector. There is even a fall of their Camelot in the form of the temptation of money and fame, which draws out a faction of riders led by Morgan (Tom Savini), the resident black knight who undertakes every competition with a little more competitive aggression and physical gusto than most.